Wow! One hundred posts! I can't believe it! What an interesting experiment it has been so far! It's a strange beast, this blog thing. I really feel as if I'm writing to myself most of the time, even though I'm aware that others will read it. I guess it's that delayed response that does make it feel more like a journal then a public posting. Then the comments come, and you realize that there are people out there reading it, from all over the world, and it morphs into an exchange rather than a recording. I remember the thrill I got when I read comments from international readers. It was, and still is, so amazing to think that someone is sitting at there computer on the other side of the earth, looking at your work. I think it does have the power to bring the world closer together. Another thing I'm absolutely thrilled about is my new art journal class at MDW on September 27 at 1:30. I have been waiting to teach an art based class, and there couldn't be a better one for me then art journaling. I know it is quite en vogue now, but I've been doing it all of my life. I even took a feminist journal writing class in college. As Matt and I were bringing the books back in from the garage last night (new bookshelves, wahoo!!! ), I could fill up a whole cube with journaling/creativity/artists books, some I've had since college. Yet, I'm still working on the details of the curriculum. I've been doing this for so long, I'm not sure what would entice somebody new to art journaling to try it. I know what I like, but will others like it, too? I hope that if I teach my passion, it will ignite the passions of others. I just hope I can spark it enough to get them to sign up in the first place! Which leads me to today's entry for Creative Therapy. 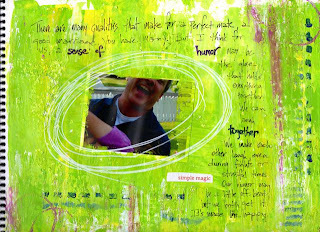 It is an art journal page, for the topic, "What's the one quality you look for in a romantic partner?" If I had to pick just one, I'd have to go with a sense of humor. It's what's gotten us through tight patches, defused arguments, and just plain made life fun. It may not be the most "romantic" quality, but it's a relationship lifesaver and spark at the same time. 15th anniversary this December, so I'd say it's working pretty darn well for us! yes casey we are thrilled to be able to sit at our computers and look at your art and read your words! the art journal class is a great idea and i think it will eventually have a good turn out. i also have to say that i agree with you 100% on the sense of humor thing. you gotta' be able to make me laugh and you have to be able to laugh at or with me!! that's what is definitely important because when all else fails and times are bleak, laughing can make it all seem just fine. "I really feel as if I'm writing to myself most of the time, even though I'm aware that others will read it. I guess it's that delayed response that does make it feel more like a journal then a public posting. Then the comments come, and you realize that there are people out there reading it, from all over the world, and it morphs into an exchange rather than a recording." I so can relate. I'm not sure how to describe the feeling I get from seeing something I had in my head finally in print.